I had a vivid reminder of one of this blog’s central themes while riding my bike around the other loops in Pine Ridge campground at Itasca State Park last week. I was looking at damage from the July 2 storm that swept through the park and knocked down so many old, beautiful trees. At the same time I was struck at how private most of the campsites in the Pine and Poplar Loops are, and I remembered that Sue, Aaron and I camped in one those sites years ago, when Aaron was in elementary school. In many campsites you would be hard-pressed to see a neighbor on any one of 3 sides, and in most cases there wasn’t a campsite directly across the road, either. Thick undergrowth and trees separate most sites, even after the storm. None of the campsites in these loops, however, have electricity. 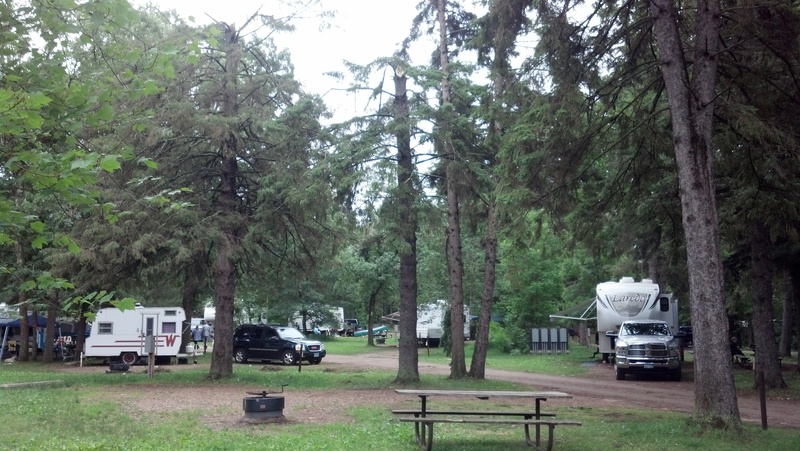 By contrast, campsites in the Oak Loop where we stayed are very open and neighbors are in plain sight. Everywhere. Yep: we were square in the middle of the hillbilly section of the campground. A place where, all those years ago when we were tenting it in either the Pine or Poplar Loop, I swore I’d never camp. Because it didn’t seem like real camping. And yet, when daytime highs hit the mid-80s and the dew point was in the upper 60s, the AC in the trailer felt mighty good. It felt even better when we were at Scenic State Park from July 1-4 and highs were in the mid-90s, with dew points in the low 70s. Sweet. Fancy. Moses: That was unpleasant. Had we been tenting it, I’m pretty sure we would have bailed. These are the tradeoffs that I struggle with: the reality that I’m no longer willing to put up with many of the discomforts and inconveniences of tent camping (except, of course, for wilderness trips to places like the BWCA) and the chagrin of having to sacrifice some of the things I most enjoy about camping — like having a campsite with some privacy.